Join the New York Chapter of Mercy For Animals for free food, warm drinks and an inspiring presentation about the simple actions each of us can take to help put an end to needless cruelty to animals. For years there has been a solid base of vegans, vegetarians and animal rights activists in the Syracuse area. 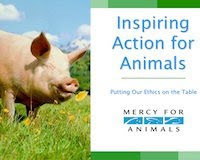 This Inspiring Action for Animals presentation seeks to unite the animal-friendly Syracuse community in an effort to create a society in which all animals are treated with the respect and compassion they so rightly deserve. This heart felt presentation reminds viewers that cows, pigs, chickens and other farmed animals are fascinating, intelligent and emotional beings much like our dogs and cats at home before showing how modern industrial farming has changed the way these animals are viewed and treated by our society. With a strong call to action, this presentation leaves the audience with a powerful message of hope and pragmatic tips about how each of us can help end needless cruelty to animals. Great tasting vegan food will be generously provided by Strong Hearts Café, which has been serving affordable and delicious animal, earth and health friendly food in Syracuse since 2008. This event is free and open to the public. Visit http://www.facebook.com/#!/event.php?eid=184365818261194 for more information and to RSVP. This entry was posted in Uncategorized on February 15, 2011 by saro.